※１ The shredder blades are options. Crushed tree branches, such as thinned wood pieces, are cut into small chips with the chipper blades at the primary stage and further cut into fine pieces with the optional shredder blades, if employed, at the secondary stage. Incorporates a maximum processing diameter of 172 mm, which is the greatest of this class. 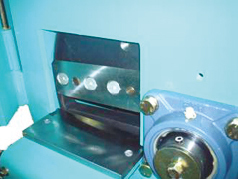 The two crushing stages output fine chips in uniformed size with a reduction of capacity to approximately 1/7. 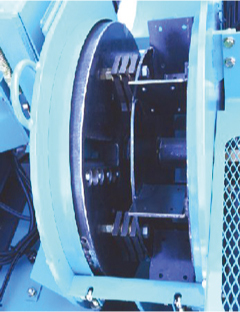 The feed speed of crushed pieces is finely adjusted between 0 and 25 m per minute with the feed adjustment dial. The size range of crushed chips is selectable up to approximately 10 mm from a powdered state. 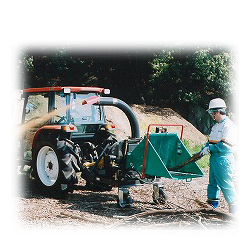 Uses the power take-off (PTO) drive of your farm tractor, thus ensuring ease of use. 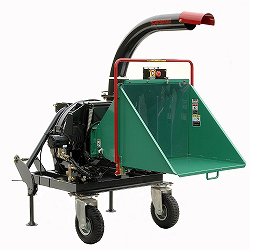 The chipper blades and shredder blades are highly durable. 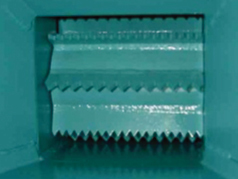 The chipper blades are of made of highly durable special steel of double-sided construction and the shredder blades use durable steel of four-sided replaceable edges. Uses switches of noncontact type with excellent waterproof performance, which rarely fail to operate. Specially designed chipper blades and bed blades. 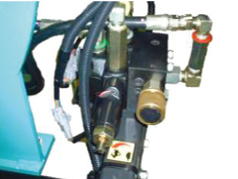 Uses hydraulic devices developed in house, thus ensuring ease of maintenance. 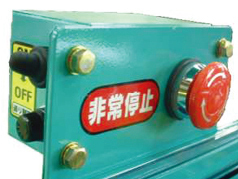 Equipped with an emergency stop switch that ensures safe operation. The weight-balance design of the rotor as the core part of the product has high inertia force with preeminent durability. Equipped with a 22-HP high-performance diesel engine that is clean and environment-friendly. Inexpensive and high cost performance compared with other companies’ products of this class. Weighs 345 kg and can be loaded onto light trucks with ease. Loaded to light trucks for speedy movement to narrow places. Possible to save expenses for industrial waste disposal by the capacity reduction of the waste delivered to industrial waste processing contractors. Ensures safe loading onto and discharging from trucks with a sling and hook.